I read a lot in front about Chef Wylie Dufresne’s cuisine and his restaurant WD-50 , and therefore I already had a certain idea of what would await us there: experimental compositions, ironical interpretations of American dishes and amazing desserts. 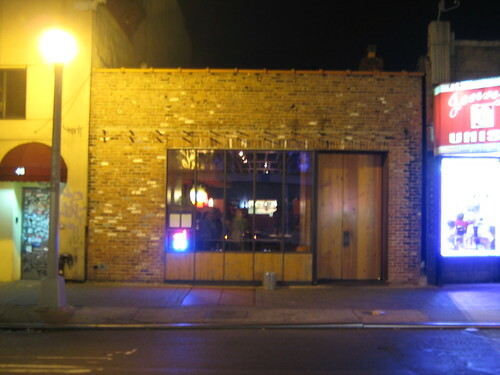 This conception became even clearer when we read the menu and my friend Jeff and I quickly decided we’d go for the tasting menu with wine pairings so we don’t miss any of the kitchens’ creativity. The ambiance in the restaurant is pretty relaxed and the style reminded a mixture of a diner and a garage with warm colors and a wood fire which brought some coziness. As we observed satisfied fellow diners who already attacked their desserts we were served our first starter. Daurade, artichoke dried lime and pumpkin was a nice neutralizing starter, the chunky texture of the pumpkin was quite interesting, the Daurade however didn’t have a big appearance as the lime and the pumpkin took a bit over. Then Pizza pebbles, pepperoni, shiitake was one of these humorous dishes which reinterpreted American fast food culture. The small pebbles had an intense taste of pepperoni pizza as you chew on them. Here again, the taste of it was quite strong so that you could barely taste the shiitake and the small bits of fresh Oregano which were sprinkled on top. The accompanying wine for the first two starters was a Cava with a creamy perlage but a rather average body with a slight iodic note. 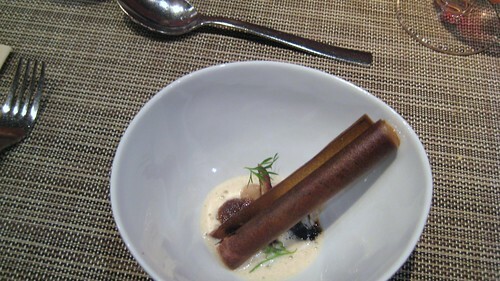 Next came WD-50’s interpretation of Foie Gras as a knot. The Foie knot was covered with tiny cracker balls and came with a special kind of cilantro leave and dots of 2 kinds of sauces. The Foie didn’t taste as rich as you’d expected it – it only deployed in the very back of your palate said Jeff. The crackers added a nice play of texture but didn’t add any flavor. As of the sauces, they didn’t bring any subtlety to the dish. I guess it’s a dish I didn’t quite understand – it was beautiful for the eyes but didn’t make much sense to me on the palate. But this might be, as usual, a matter of personal taste. The accompanying German Mosel-Riesling though, very fruity and slightly sweet was quite good and saved the course a little for me. Hamachi tartare, sea beans, sake lees tahini, grapefruit shallot wasn’t actually a tartare, since there were 2 larger cubes of hamachi on the plate. I loved the 2 cut out sticks of Japanese pear which lied on top – Finally someone found a use for this fruit which I always found too watery to be eaten on its own. It added a fresh fruity subtlety to the Hamachi. This dish showed again that the play of textures is something which is emphasized and executed very well at this restaurant. Here we had the contrast between the soft fleshy texture of Hamachi, the crunchy pear stick and the creamy Tahini. Beef tongue, fried Mayo, tomato molasses sounded and looked again like a humorus punch line, maybe a reinterpretation of some junk food dish with mayo and ketchup (hotdog?). The beef tongue came as a long thin slice which was twisted and twirled; next to it were 2 balls of fried mayonnaise which came out liquid when you bit in it and a smear of bitterly intense tomato molasse. The dish was fun especially with the fried mayonnaise but what bothered me a bit was the pretty neutral taste of the beef tongue. The wine pairing for these last 2 dishes was quite awkward: Kamiakin Sheridan Valley 2006 from Yakima Valley in Washington was a Semillon-Sauvignon blend with an intense nose of… bubble gum! Never had such a bouquet before and was therefore quite surprised. It was interesting to try this wine but I guess I wouldn’t buy it on my own. 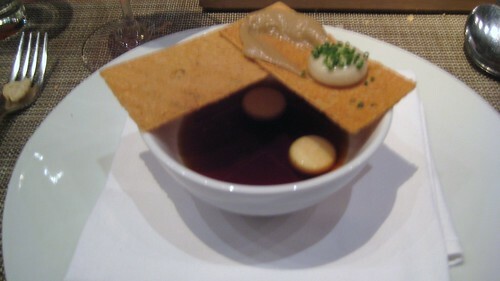 Then came a real highlight: French onion soup which was deconstructed and reconstructed. Here everything was perfect. The onions came as a tasty onion cream on top of a cracker which lied on the soup bowl. Tiny gruyere cheese cookies floated on the soup, and when bitten on, liquid gruyere cream came out of it. The beef reduction was strong and tasty, ironically salty. Here again a nice play with textures and finally a perfect interaction of flavors – This was really convincing creativity. 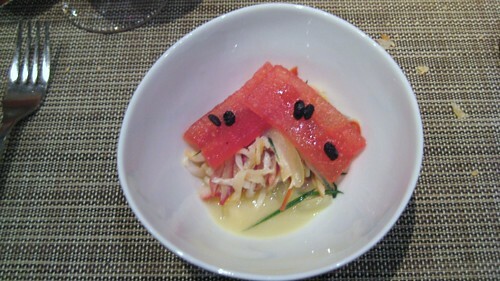 Surf Clam, Watermelon, garlic chive, fermented black bean was then again a dish which was more into freshness, reminding a Ceviche or a mussel salad. The watermelon was a nice play with the clams. The fermented black bean was something new for me and had a totally overwhelming earthy kind of taste. I think it was there to give this fresh dish some depth. I’m not sure whether it convinced me or not. It was definitely something new, which is always good in the end. The accompanying red wine, a light but perfumed burgundy matched the dish nicely: the link here was the kind of earthy taste of the black bean. The lamb belly, black chickpea, cherried cucumber was the main meat course of the menu. The lamb was cut and grilled like bacon stripes, and tasted a bit like crunchy bacon. This was a disappointing dish in my opinion. I expected some proper piece of meat here and when I tasted it I just thought that it is a lamb dish that I won’t miss in the future. The wine accompanying it was a very nice Spanish red, fruity, intense with depth. So far concerning the main dishes the menu was very inventive and creative, but not all courses were truly convincing, some appeared unbalanced, others a bit overdone, lacking subtlety in the flavor interaction. The lamb was a big disappointment. But now came the desserts, and I’ve read some great things already about pastry chef Alex Stupaks’ creations, which made me quite curious and raised expectations of course. First came date sorbet, pandan-soymilk and matsutake which was a nice composition with a slightly salty touch I liked a lot – kind of representing the transition from savory to sweet. The date sorbet was rich and matched very well with the soy milk. Nice balance, nice flavor combination. 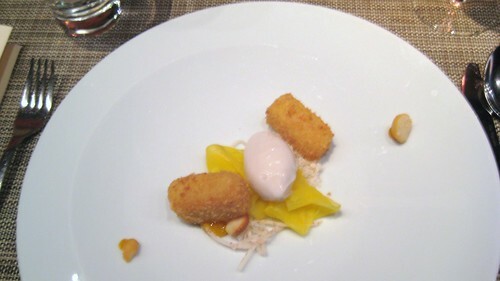 Next dessert was Fried butterscotch pudding, mango, taro, smoked macadamia which was also excellent. Butterscotch came out warm and liquid out of a fried shell and matched well the mango and the taro roots. 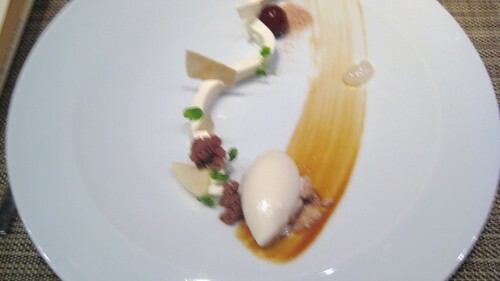 Finally Soft white chocolate, with potato, malt, white beer ice cream, was amazing. I think this was the best dessert I ever had – a perfect wonder of sophistication and subtlety. All these ingredients seemed to belong to a same flavor category but each representing another slightly different layer of taste. The white chocolate matching the starchy taste of potatoes, the maltose taste of the cream, and the excellent white beer icecream. Also the wine match, a – rather known to be cheap – Cyprus sweet wine of Commandaria St John which has a slightly rancid taste actually matched perfectly the dessert since it reminded a little maltiness. Chapeau! Alex Stupak truly transports one through a world of flavor and makes one discover slight and subtle variations of flavor matching the most unexpected ingredients. Wow! So in the end we realized that this menu had to be split in 2 halves which can be evaluated separately. As we weren’t always convinced by the savory courses we were truly amazed by the desserts, and it doesn’t surprise that the restaurant also offers dessert tasting menus. As for the wine pairings, some wines seemed too simple like the Cava and the way too easy Burgundy, others were pretty surprising like the Sauvignon-Sémillon blend from Washington and then there were 2 or 3 very good pairings like the Sweet wine with the white beer dessert.